We’d love your help. Let us know what’s wrong with this preview of Heal Your Body by Louise L. Hay. 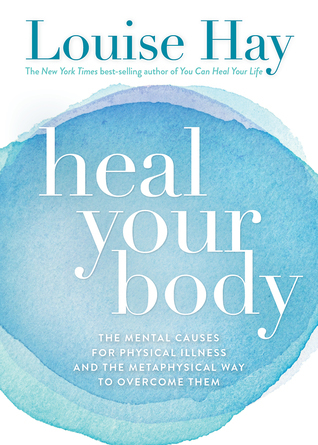 To ask other readers questions about Heal Your Body, please sign up. Mamata Mahanta my nake back pain in 1 month so how solved my back pain. What can I say about a book written by a woman who states that babies are born with birth defects because they CHOOSE to be born that way?? Nothing good! At all! Shame on you Louise Hay! I read this booklet right after the popular science book “Microbe Hunters” (Paul de Kruif), in which I found this statement, as true now as it was when the book was written in 1926: "Murderous germs are everywhere, sneaking into all of us, yet they are able to assassinate only some of us, and that question of the strange resistance of the rest of us is still just as much an unsolved puzzle as it was in those days of the roaring eighteen-eighties when men were ready to risk dying to prove that th I read this booklet right after the popular science book “Microbe Hunters” (Paul de Kruif), in which I found this statement, as true now as it was when the book was written in 1926: "Murderous germs are everywhere, sneaking into all of us, yet they are able to assassinate only some of us, and that question of the strange resistance of the rest of us is still just as much an unsolved puzzle as it was in those days of the roaring eighteen-eighties when men were ready to risk dying to prove that they were right." That “strange resistance” (or an increased susceptibility, which would be the other end of the spectrum) is what I hope alternative medicine can help explaining. Despite my scientific background and profession (both in medical research), I believe that the only way to get a full picture is to listen to both sides, i.e. study the traditional scientific explanations of disease as well as the alternative spiritual ones. I’m hoping that the addition of alternative medicine literature such as this booklet (and of course, personal experience and observation) to the scientific study reports, patient records and medical textbooks I read will give me this full picture. Hay is often criticized for arguing that all disease is caused solely by unhealthy mental attitudes. Personally, I don’t think there is any reason why this booklet should have to be interpreted in that way. In the preface of this 67th (!) 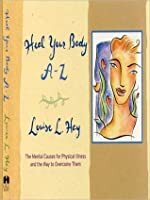 edition of “Heal Your Body”, Lousie L. Hay writes: "[f]or us to become whole and healthy, we must balance the body, mind, and spirit". Later on in the text, she states that “[t]he mental thought patterns that cause the most dis-ease in the body are criticism, anger, resentment, and guilt". My interpretation of that hyphen is that it’s there to differentiate “dis-ease” from “disease”, which usually refers to the end result of increased susceptibility (“dis-ease”) coupled with physical causes. It’s hard to disagree with such a holistic view! After the short introductory chapters, the booklet is a kind of encyclopaedia where the reader can look up a specific health problem to find its probable mental cause and a suggested “healing affirmation” to use as a remedy. I found some of it almost comical (“Problem: Bug bites, Probable cause: Guilt over small things., New thought pattern: I am free of all irritations. All is well.”), but surprisingly much of it made sense to me when I “tested it” on myself and others I felt I knew well enough. I’m sceptical to whether the affirmations can make much of a difference, but I can obviously not refute it without having tried them. To someone stuck in a negative thought pattern due to depression (i.e. low serotonin levels), this booklet certainly doesn’t give much hope for the future! I’m still hoping that it can be a useful complement to scientific explanations and, who knows, maybe I’ll find that it does this job well enough for me to give it another star. I understand that positive thinking can go a long way in improving your general health, but please don't insinuate that it can fully cure slipped discs, cystic fibrosis, AIDS...if positive thinking and chanting, "THIS MOMENT IS FILLED WITH JOY. I NOW CHOOSE TO EXPERIENCE THE SWEETNESS OF TODAY" would cure my Diabetes Mellitus, trust me--I would've been able to toss my needles and meters a long time ago! Wow. I've known about affirmations and that they work for promoting behavioral changes since I was very young. I can remember doing affirmations when I was in middle school (I was born in 1967). I can't remember having actively used them in the past 15 years. That is about to dramatically change. I've suffered from clinical depression for decades and I feel like Louise Hay's insights may profoundly change IMPROVE my day-to-day life. I know this for certain, it will not hurt or make things worse. S Wow. I've known about affirmations and that they work for promoting behavioral changes since I was very young. I can remember doing affirmations when I was in middle school (I was born in 1967). I can't remember having actively used them in the past 15 years. That is about to dramatically change. So many of the connections she makes between "mental causes" and "physical illness" have rung true for me (in conditions I once suffered from but are not presently experiencing as well as with conditions I am currently experiencing). And, some of those revelations aren't easy to acknowledge or accept either. This book gives the positive waves to our body... "YOU ARE WHO YOU THINK YOU ARE" is the basic of this book. Its about how we can mentally heal our physical body "metaphysical". It gives a detailed healing method for every pain and suffer u have in ur body and mind, with no medicines or treatments but by Your Thoughts. I think its very useful to have it in our hands. Physical pain goes or not, am sure... if we follow, we feel Positive. Well, if you know me, you know I am into ways of natural healing and all that hippie crap. So, Bev gave me this book and I really did love it. Even though it is more like a guide than a book, I really learned a lot from it. Saying the affirmations in it really have helped me with my anxiety. Louise Hay offers an explanation for illness that is different from the medical perspective and takes into account the whole person. She is a ground-breaking author and spiritual teacher with a wealth of wisdom to offer. Un librito cortito, que se lee en una hora, aunque estate preparado para no sentirte hipocondriac@. Muy ciertas las razones de los malestares, en muchos estaba consciente de que así eran. Recomendable para aquellos que quieran cambiar sus vidas. well... i guess its each to their own. Opened my eyes to how our emotions truly affect our physical. Very insightful. I loved it. The amazing Louise Hay 💖💖💖 I am grateful always. Good Book. LOUISE HAY WAS WORKING WITH AIDS WHEN MERILYN TUNNESHENDE CAME ALONG, LOOKING FOR AN ENDORSEMENT. BELIEVE I.T. OR NOT...LOUISE WAS AFRAID...WHICH IS UTTERLY AMAZING...GIVEN THE INFORMATION THAT SHE PUTS OUT. BUT IT IS THE TRUTH. THE AWESOME THING IS THAT LOUISE IS NOT FAR FROM BEING CORRECT IN HER MENTAL AND VERBAL AFFIRMATIONS AND ASSERTIONS. THAT IS NOT TO FEED EGO...BUT RATHER TO GUIDE TOWARDS HUMILITY...REPARATIONS AND ACCURACY. This is a really short book read within an hour. I love the book as it offer alternative ways of healing. It does not claim to cure anyone and it has a different perspective on a persons healing process. If you don’t believe in spiritual or alternative healing then this book is definitely not for you. Although the affirmations are incredible and still worth using. pretty awesome little book. I found that a lot of these illnesses was/is right on with the causes. Now to put it to the test. Louise Hay is awesome. I have enjoyed reading several of her books. The movies of my mind are beautiful because I choose to make them so. I love me. This review has been hidden because it contains spoilers. To view it, click here. Heal your body, es un libro fácil de leer, pero cuesta un poco el poder creer en lo que se lee y aún más llevarlo a la práctica. La autora empieza con una serie de recomendaciones que te permiten comprender un poco mejor la lectura y a lo largo de la historia comparte experiencias que te hacen entender muchas de las cosas que te pasan, a veces uno no entiende la situación en la que se encuentra, hasta que la ve reflejada en alguien más. Éste es un libro pensado y escrito para todos aquellos que Heal your body, es un libro fácil de leer, pero cuesta un poco el poder creer en lo que se lee y aún más llevarlo a la práctica. Éste es un libro pensado y escrito para todos aquellos que piensan que la mente es tan poderosa, como para poder sanarnos de todo. I don't know, I couldn't get into this book. I'm always looking for good books on positive manifestation / the law of attraction, but I read her biography and the very beginning of the first chapter, and, I don't know....is it me, or is she really judgmental? Not just towards others, but to herself as well. I also think she's taking the law of attraction waaaaay too literally. While I get the concept, I found some of her notions to be rather far-fetched (not EVERYTHING is our fault - and I doubt I don't know, I couldn't get into this book. I'm always looking for good books on positive manifestation / the law of attraction, but I read her biography and the very beginning of the first chapter, and, I don't know....is it me, or is she really judgmental? Not just towards others, but to herself as well. I also think she's taking the law of attraction waaaaay too literally. While I get the concept, I found some of her notions to be rather far-fetched (not EVERYTHING is our fault - and I doubt we choose our parents). I find this to be a very informative and encouraging read. The book talks about awakening within us the ability to contribute to our own healing process. It shows us how many mental issues can cause physical illness, and how we can begin to help ourselves through positive affirmations as well as a positive mental attitude about ourselves. I understand what the author is saying and I'm definitely going to follow the steps in the book. Very interesting and inspiring. I read this book years ago but I'm sure it's just as insightful through its numerous editions. The book touches on deep metaphysical principles when applied can have amazing results for mind, body, and soul. Of course, the work is always with the individual and books like this can only point the way. Worth reading and referring to from time to time. I am not sure what to make of this book. Undoubtably there is a connection between thought, feeling and bodily health, but I can't figure out how to express it. Some of the prayers/mantras seem very apt for the bodily health issue. Others not so much.